The passengers in this brand new Volvo XC60 weren't expecting anything out of the ordinary as they drove away from an airfield northeast of London yesterday afternoon two years ago. 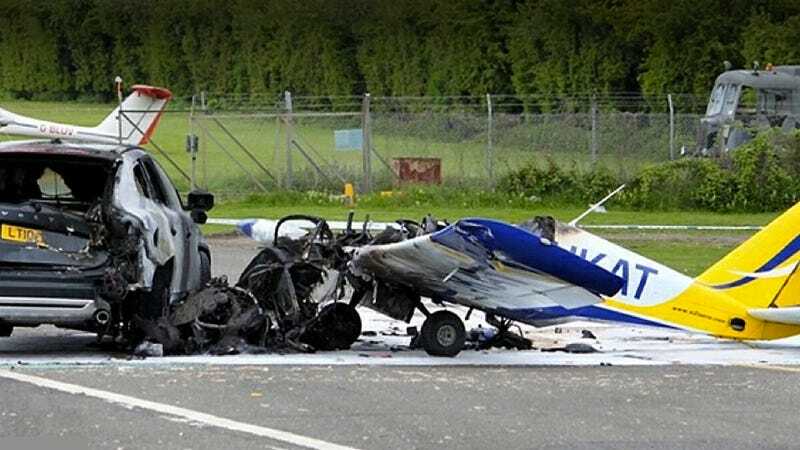 But the pilot of an small AT3 aircraft botched his landing somehow, hitting the car. The pilot suffered serious injuries, and his plane was almost completely destroyed, but the Volvo passengers are poster children for Volvo's legendary safety credentials: they emerged from the wreck unscathed. Luckily, the airfield had a fire crew on duty for a drag race being held nearby, so they were able to rush over and put out the resulting fire. Station Officer Len Cleary told the Daily Mail that the Volvo's passengers managed to get the pilot out of the plane before its cockpit became engulfed in flames. Now that they've passed the moose test and won a fiery plane-car crash, we'd say Volvo's SUVs are doing pretty well. Originally, we said this was earlier this week. It turns out it's a two-year-old story. Still an awesome photo. — Ed.